Idaho Infant Toddler Program provides early intervention services, including educational and therapeutic services, designed to increase the ability of families to nurture and meet specific needs of infants and toddlers with developmental delays. The goals of the services are to enhance the child's development and to reduce the child's delay in development. Easter Seals-Goodwill Northern Rocky Mountain provides services for children and adults with disabilities and other special needs, and support to their families. Under the Tax Equity and Fiscal Responsibility Act of 1982 (TEFRA), states may provide Medicaid coverage to children with severe disabilities, disregarding their family income, if these children require care at an institutional (hospital, nursing home or intermediate care facility) level. When a child receives extended care in an institutional setting, family income is disregarded as a qualification for Medicaid. The TEFRA State Plan Option makes it possible to do the same for a family whose child requires care at the level provided in an institution, but who choose to care for their child at home. Currently, 18 states and the District of Columbia have chosen to implement the TEFRA State Plan Option. Because states vary widely in the availability of institutional care for children and the clinical criteria for admitting children to these institutions, the numbers of children and youth with special health care needs (CYSHCN) who receive Medicaid benefits under this option also varies widely from state to state. Please check with your state office to see if TEFRA is offered in your state. The past decade has seen an explosion of information on the human genome, and the medical community recognizes that genetic information and testing has the potential to affect medical care for all individuals, not just those with birth defects or rare genetic conditions. Ds Connections co-founders Susan Villelli and Cheryl Roberts are two Moms who believe in keeping their children, their families and their friends connected to each other through the love of their children diagnosed with Down syndrome. Idaho Parents Unlimited supports, empowers, educates and advocates to enhance the quality of life for Idahoans with disabilities and their families. 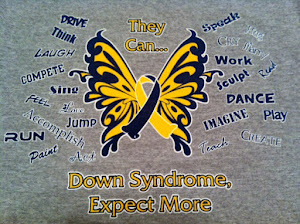 Down Syndrome - Up Up Up and Away! The information in this blog is our opinion based on our research and what has worked for us. We have spent many hours researching and knew we had to put all that we have learned in one location for future parents and children. We will continue to research and share with you. We strongly encourage you to do additional research and find what works best for your child. God bless you and your family on this exciting journey. Awesome Inc. theme. Theme images by TommyIX. Powered by Blogger.